Все видео пользователя: Gogi Tech. Samsung launched the Galaxy M10 and the M20 handsets in India, this is the new series by Samsung aimed at the Indian millennial consumers. Samsung Galaxy M10 Price in India starts from Rs. 7,990. Do check the video review to see what you will get inside the box and overall performance, including PUBG game play and more. 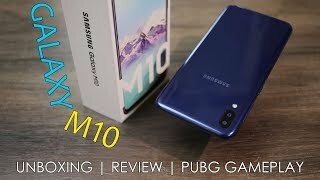 Samsung Galaxy M10 price in India is Rs. 7,990 for 2GB/16GB variant and the Galaxy M10 3GB/32GB variant price is Rs. 8,990. Samsung Galaxy M10 is using a plastic body with a good built and finishing, curvy body and the glossy finishing gives it a premium look and is easy to handle / operate. But what impress most are the new UI and the 6.2 inch screen with 19:9 aspect ratios, with dewdrop notch. There are dual cameras on the rear and the quality is above average, the edge detection needs improvements and it can be done via software updates. Camera quality is above average, do check the samples below. Samsung Galaxy M10 houses a 3400 mAh battery that takes 2 hours 30 minutes to 3 hours for a full charge with 5V/1A battery included in the box. You can get up to one to one and a half days of battery life. M10 comes with triple slots which means there is a separate micro SD card slot too. Dual VoLTE is supported. You can play PUBG game on this handset in low quality mode, do check the Antutu score and the pubg game in action in the video below. So overall the handset looks pretty good and when it comes to price, considering the brand value Samsung, this time Samsung got 'M' right. M10 is perfectly priced at Rs. 7,990 for the 2GB/16GB variant and Rs. 8,990 for the 3GB/32GB variant.